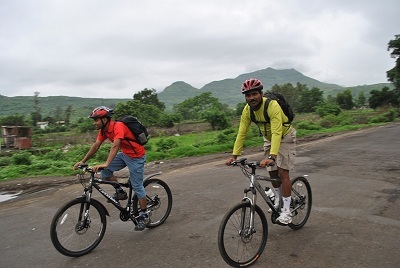 6 Bhramanti cyclists scaled the Bhor ghats successfully on bicycles on 3rd July 2010. It was a cloudy day without any rain. Entire team of 6 cyclists boarded the 4:43am CST - Karjat local from various stations & reached Bhivpuri at around 6:50am. Started cycling from Bhivpuri to Karjat which is a 7 kms run on the road which runs nearly alongside of the Karjat rail. The early morning was quite scenic with paddy fields on our left side with the rail line & the hills range on our right side studded with numerous waterfall streams. On the way, we waved to the school children while couple of time taking a pause & answering to there simple questions about the cycle which we were using! We reached the karjat junction where we had some hot wada-pav & chai. We set towards the ghats via Khopoli. It was a speedy ride with not so good road. Reaching Khopoli, we took the left turn on the old Pune highway. There was a healthy traffic & we had to constantly look around for the vehicles approaching from rear. Had to put on the rear light blinkers. Average speed was 18 on this section till we approached the start of the ghat. After exiting Khopoli, the traffic dropped drastically to suit our need. Our speed dropped too! It was around 8 kms/hr at the initial section of the ghat. Further after a couple of turns, it dropped further to 4 kms/hr! The most straineous section was near the Temple. The 4 hair pin bends coupled with high gradient made it quite tough. Finally we reached section of the expressway which is common for all vehicles. The climb was gradual on this section. There after, we rode with a gradual speed till we exited the expressway at Khandala. We continued till Lonavala & ended our first leg of tour near Vulvan. We took around 1-1/2 hr to climb the actual ghat from Khopoli till Khandala non stop. After having good snacks at the Manashakti Kendra, we started our much awaited descent journey to Karjat. It started raining too. We had to put our headlights & tail lights. 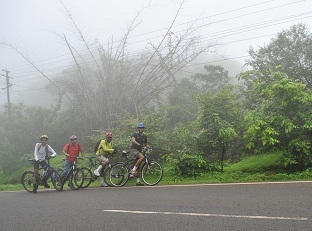 Fortunately, it stopped raining after we reached Khandala where we started the actual descent. This moment was the time of our cycling life I would say! Speedy turns & on the high slopes offered some thrilling moments. Having reached the expressway, we could see ourselves zooming past the trucks & few motor bikes too. Speed was around 55 kms/hr & we had to concentrate hard on our rides. We saw few people in the buses & cars waving & clicking pics! We couldnt click our own though! It took just 15 min. from Khandala till we touched Khopoli against the 1-1/2 ascent! It was a boring ride then while riding back from Khopoli to Karjat in the humid day. We took the CST fast local at around 4.15pm. Had to dismantle the front wheels so as to take our cycles as luggage (To be noted by all cyclist so as to carry cycles in trains). It was more of endurance activity climbing one of the steepest ghats using the old highway! Did not attempt to get out of our seats opportunity to click pics since were quite exhausted! We did 85 kms. Quite a fulfilling ride...Look forward for some few more this season.